At the Laboratory of High Energies (JINR, Dubna) a unique approach was elaborated with hypernuclei produced by the excitation of the beam nuclei and their decays observed at a distance of tens of cm behind the production target. While the very first experiments were carried out in the Synchrophasotron beams, more extensive hypernuclei research programme is planned for the Nuclotron accelerator and the new spectrometer created by the authors. At the time of the conference the first test run in the Nuclotron beam was in progress. 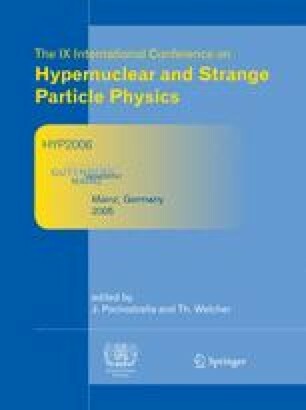 Investigation of hydrogen hypernuclei isotopes is in the first line of the experimental research plans. Namely, lifetimes and production cross sections of Λ 4 H and Λ 3 H will be measured. Search for Λ 6 H is also among the tasks. Supported in part by Russian Foundation for Basic Research, grant 06-02-16945.